Kingston 8GB USB 3.0 DataTraveler 50 (Metal/Purple). DataTraveler® 50 is a lightweight USB Flash drive. Kingston 16GB USB 3.0 DataTraveler 50 (Metal/Green). DataTraveler® 50 is a lightweight USB Flash drive. Kingston DT100G3/16GB DataTraveler 100 G3 16GB USB 3.0 Flash Drive. Kingston's DataTraveler 100 G3 USB Flash drive is compliant with next-generatoin USB 3.0 specifications to take advantage of technology in newer notebooks, desktop PCs and digital devices. Kingston 32GB USB 3.0 DataTraveler 50 (Metal/Green). DataTraveler® 50 is a lightweight USB Flash drive. Kingston DT100G3/32GB DataTraveler 100 G3 32GB USB 3.0 Flash Drive. Kingston's DataTraveler 100 G3 USB Flash drive is compliant with next-generatoin USB 3.0 specifications to take advantage of technology in newer notebooks, desktop PCs and digital devices. 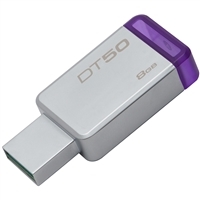 Kingston DT100G3/64GB DataTraveler 100 G3 64GB USB 3.0 Flash Drive. Kingston's DataTraveler 100 G3 USB Flash drive is compliant with next-generatoin USB 3.0 specifications to take advantage of technology in newer notebooks, desktop PCs and digital devices. Kingston 64GB USB 3.0 DataTraveler 50 (Metal/Green). DataTraveler® 50 is a lightweight USB Flash drive.